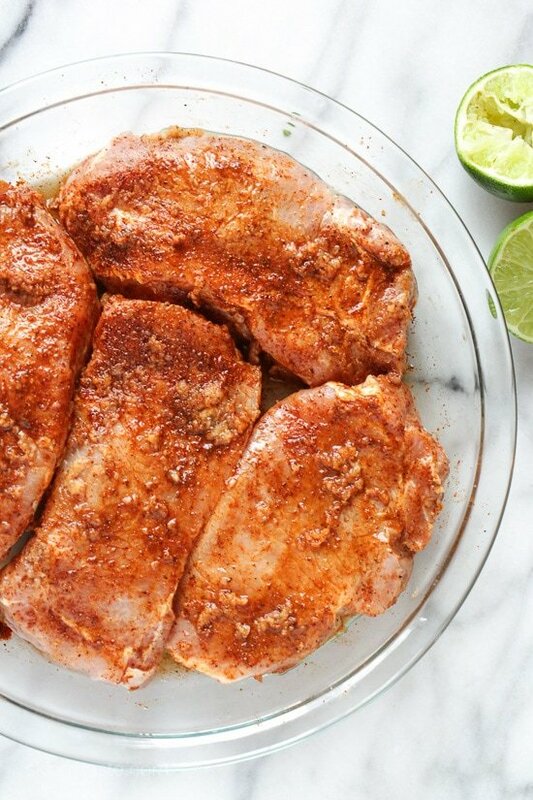 These garlic lime pork chops are so EASY to make, and they only take 10 minutes to cook. I usually make them in my broiler but they are also great on the grill, they come out juicy and SO flavorful! You can let them marinate as little as 15 minutes or as long as overnight. Some of you may recognize this recipe, I first posted it back in 2009 and re-shot it as it was in desperate need of a photo makeover. I served this with cilantro lime rice on the side using brown rice instead of white but this would also be great with a big salad. Enjoy! Trim fat off pork. In a large bowl season pork with garlic, cumin, chili powder, paprika, salt and pepper. Squeeze lime juice and some zest from the lime and let it marinade at least 20 minutes. To broil: line broiler pan with foil for easy clean up. 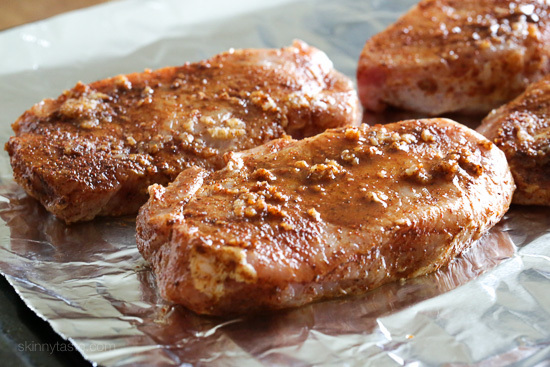 Place pork chops on the broiler pan and broil about 4-5 minutes on each side or until browned. To grill, grill over medium-high 4 to 5 minutes on each side. How many inches away from the broiler? How many inches from the grill should I cook these? These were delicious. So easy. I was a bit worried because it didn’t seem like a marinade, more of a rub but it was perfect. Juicy and quick! 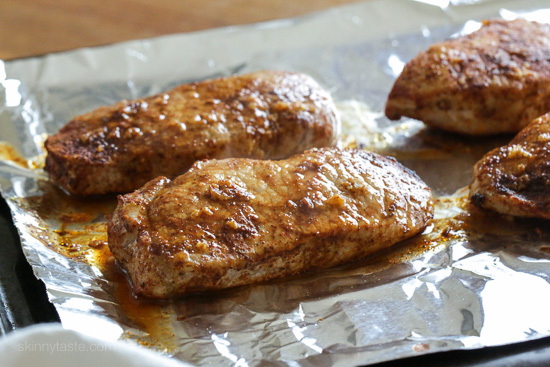 Could you marinade pork tenderloin with the recipe? Yes you can but do not cook for too long as this will make the Tenderloin hard. Add a little butter just before you bake them or broil them. Tried this tonight with the chipotle cilantro lime rice and fried cabbage with onions and fresh garlic it was delicious! Thanks for the awesome recipe!! I LOVED this. One pork chop was thicker and it turned out the best I broiled them in the oven instead of grilled. Honestly, maybe my favourite pork chop recipe ever. Well done. Last night I used this marinade on some Salmon. It was very good. The hubs liked it a lot. I will try in on skirt steak next. I made this tonite as a way to flavor up some boneless skinless chicken..I had cilantro to use up and accidentally added extra lime juice…..came out wonderful! Will definitely make again. 🙂 Great as is and also on top of salad. Holy guacamole! This was crazy delicious! Thank you, thank you, thank you!!! 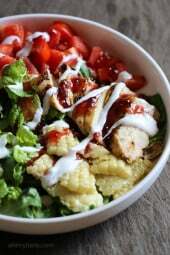 Ate it with the grilled corn salad (replaced the feta with cotija cheese, equally amazing! This pork chop is like an explosion of deliciousness in my mouth!! The marinade is a perfect marriage of lime, salt, garlic, and spices. It was so good that I honestly wish I had not thrown some of it out when I cooked the pork chops. 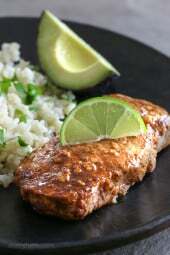 This marinade would also pair well with just about any meat…chicken, shrimp, or fish. This recipe is a keeper!! I made this last night and can’t wait for the leftovers!!! I will be making this a ton. So easy. I blended the lime juice with the seasonings and it made more of a paste that I rubbed onto both sides. I liked that because it left clumps of the marinade when we grilled. From Penzeys, I had their Half Sharp Paprika to give it a kick and their Florida Season Pepper that has citrus peel in it. This is on the list to grill next time I have people over. Oh yeah and I paired it with the Cauliflower “potato” salad. I’d say we’ll have that for leftovers but my husband ate the remaining portions 🙂 WAY home run!!! help !making now and wondering if the juice from the lime is enough liquid for the marinade? Can I use bone in pork chops instead? Sometimes the easiest recipes are the best go-to ones for a reason. This is packed full of flavor with little effort. I pair it with cauliflower seasoned with cumin, chili powder and garlic powder and then squeeze lime over it. Both the pork and the cauliflower can be made on one sheet pan. I just do the cauliflower for 5 minutes at 400 degrees, then add the pork and do 5 minutes at 400, flip the cauliflower and pork, and then broil on high for the last 4-5 minutes. So easy and so good. Thanks Gina! I just made this in the Air Fryer. 400 degrees at 12 minutes. Yummmm! Would it be better to freeze these before or after cooking? I had originally planned on using 6 chops which have been marinating overnight but last minute cancellations mean I only need 2. Love all of your recipes. Dinner party favourites! I think before, thank you! These sound delicious!! I would rater bake in the oven. How long and what temp to bake in the oven? What would you recommend serving with these? Cilantro lime rice or cauliflower rice if you want to keep it low carb! Both recipes are on my blog. This looks amazing! Is the only liquid the juice from the lime? 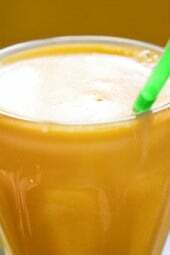 Yet another great recipe!! I made this last night and paired it with the “Southwestern Black Bean Quinoa and Mango Medley” salad (from this site!) and it was another HOME-RUN! To say this recipe was easy to prepare and quick to cook is an understatement! I put everything together in the morning in a zip-lock bag and let it marinate for the day… when I got home from work I followed the instructions and broiled for about 7 minutes both sides (my chops were a bit thick) and it came out perfectly! My family and I enjoyed this very much! The taste was fantastic and the fact that mom didn’t have to be in the kitchen all night was a HUGE bonus! Will definitely be making again! Thanks Jackie! Love easy meals! 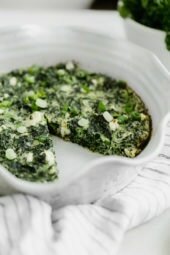 Could I bake these instead of broil? Could i just use Paprika and not use the Chili Powder?? A. MAZE. ING!!! Made this tonight, doubled the recipe, (thank God!) and served it with cilantro lime cauliflower rice. (Still doing whole30) Pezneys gave away 4 spices a couple weeks ago, and in that set was Smoked Spanish Style Paprika. So I thought I’d give it a try. SOOO good! I don’t really know how to cook, but I can follow directions. Gina, you make me look good!